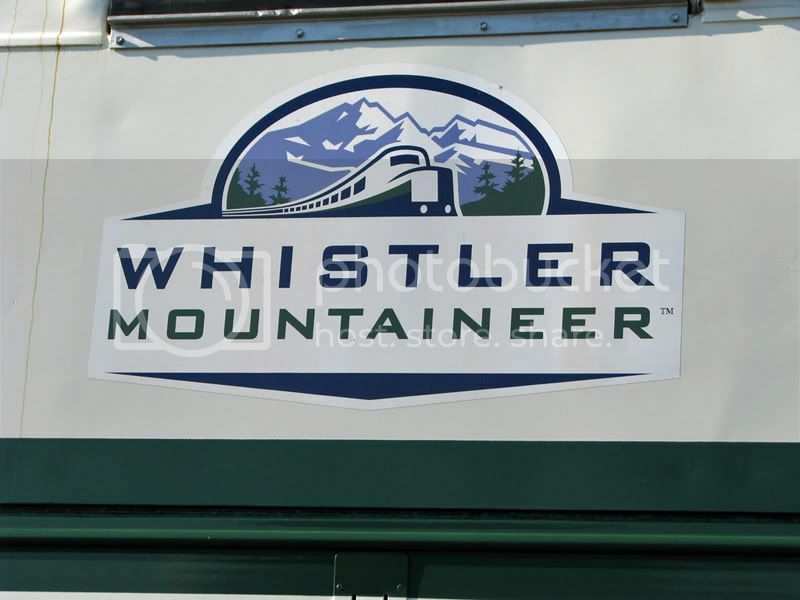 Okay time for part 2 the Whistler Mountaineer part. 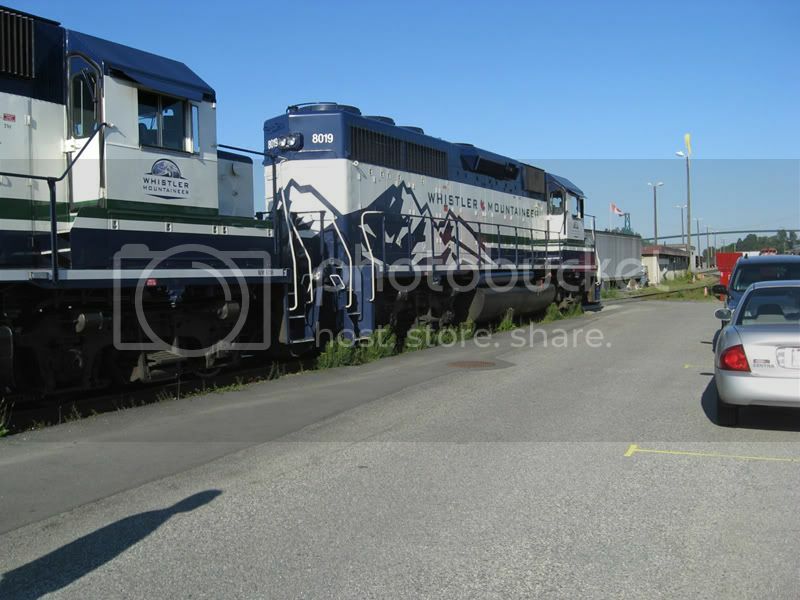 I arrived a bit early so I was able to get a few shots of the locomotives before we left North Vancouver. They are GP40-2's. 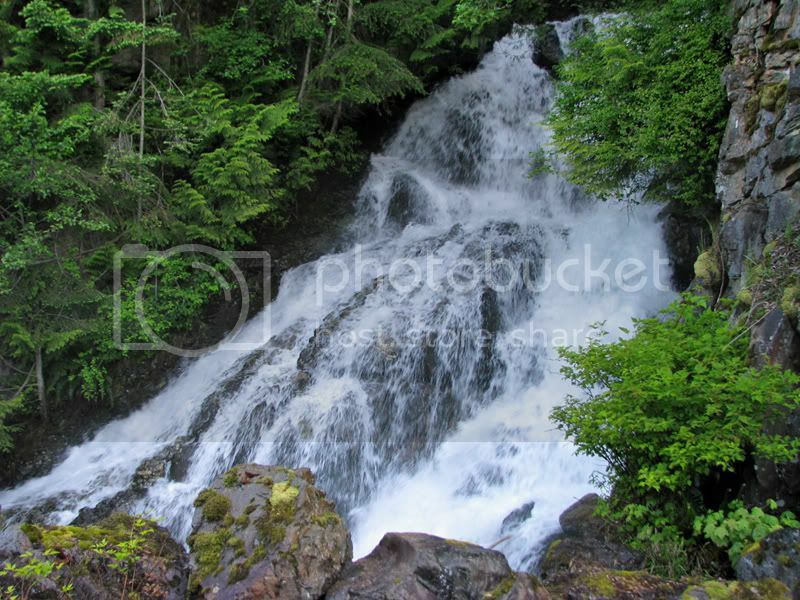 As we carried on the journey we saw many neat waterfalls that you can't see from the highway. A waterfall just past Horseshoe Bay. 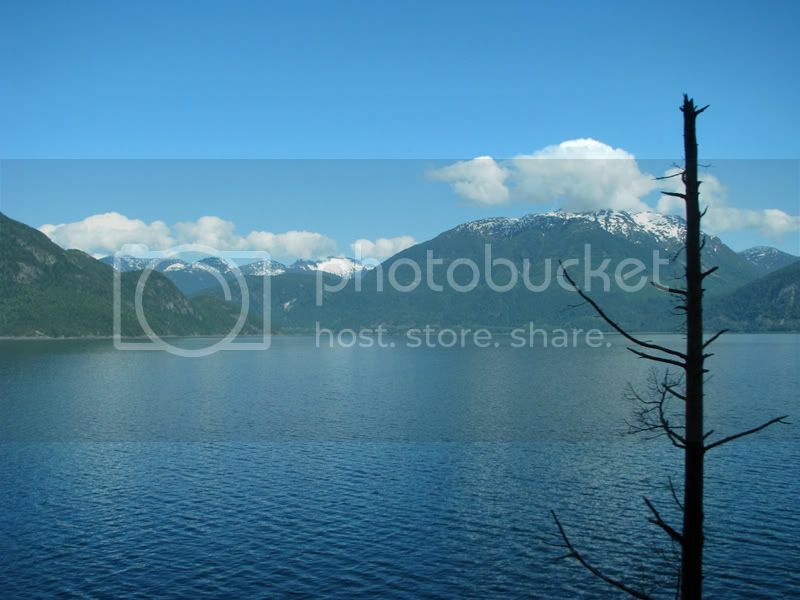 One scraggy tree amoungst the vast Howe Sound. A trestle over the Chekamus canyon. A close up of the water. Its going pretty fast! Here we are boarding in Whistler. The coaches are ex-CN coaches that have been redone. Accelerating out of a scenic stop. Rounding a curve in the canyon. Crew checking the engine out. Forward view of the train. Rearward view of the train. I hoped you enjoyed and if photobucket will ever work I will upload a few videos too. Okay video time! After several IE crashes with Photobucket I have the videos. 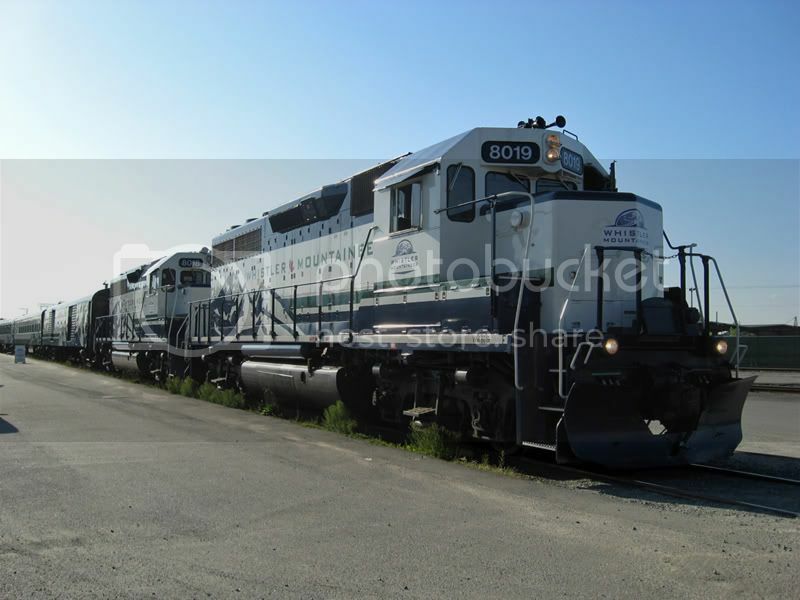 The first is the GP40-2's idling in North Vancouver. This one is a bit lucky. I randomly started filming from the back car and we happened to go through a tunnel. In this picture notice the employee in the first car. Now he is on the helper loco discussing some over a canyon! I don't believe so. Those coaches were built in the 1950's for CN, picked up by VIA Rail in the 1970's and sold in the 1990's after the major funding cuts by the government. I remember on the Pacific Wilderness we had one of those "modernized" heavyweight coaches, it's the one that's out at the Saanich Historical Artifacts Society. The car's frame was wood, in fact that's why Transport Canada had condemned it, the wood frame under the sheet metal paneling had started to rot. It started life in 1903 as a Pullman Car Co. sleeper, later converted to a coach (including sheet metal paneling over the wood), Grand Trunk Western(CN) bought it in 1971 and rebuilt it into a commuter coach. It eventually went to Ohio Central(who provided all the equipment for PAW), and made it all the way to Victoria from Ohio before the condition of the car's frame was discovered. It's a 1954 CC&F Coach, according to the Trackside Guide. CP built coaches almost simaltaneously and due to construction methods which did not match those of CC&F & CN there are almost none in service todaY. The CN fleet of coahces survives almost in its entirety though! Though the cars that CP bought from Budd are still around with VIA Rail, a testament to their stainless steel construction. 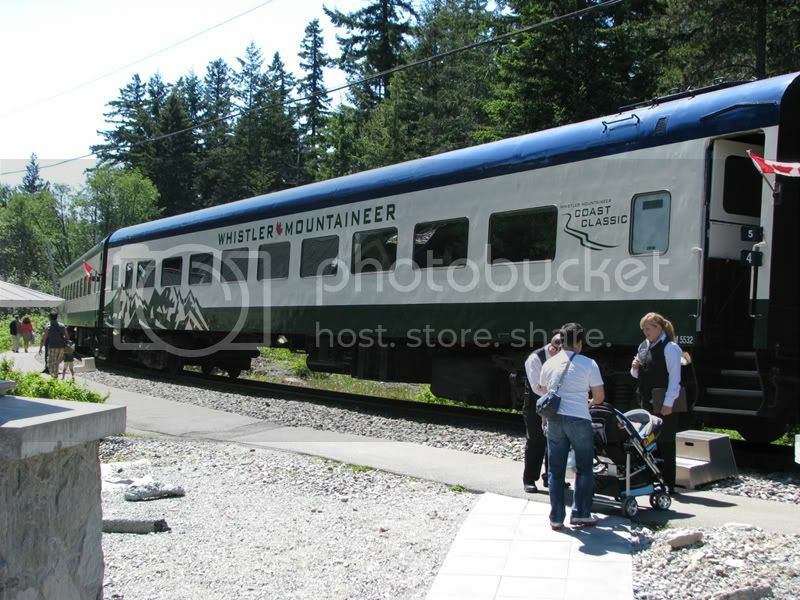 Whistler Mountaineer is up and running. With yours truly at the throttle 3 or 4 times a week. Ah! I think I've just happened to see you cruise through Squamish on the Mountaineer before. I didn't think it was you though, since I thought you were strictly with CN. Must be a nice change from dirty freight trains to clean passenger trains. 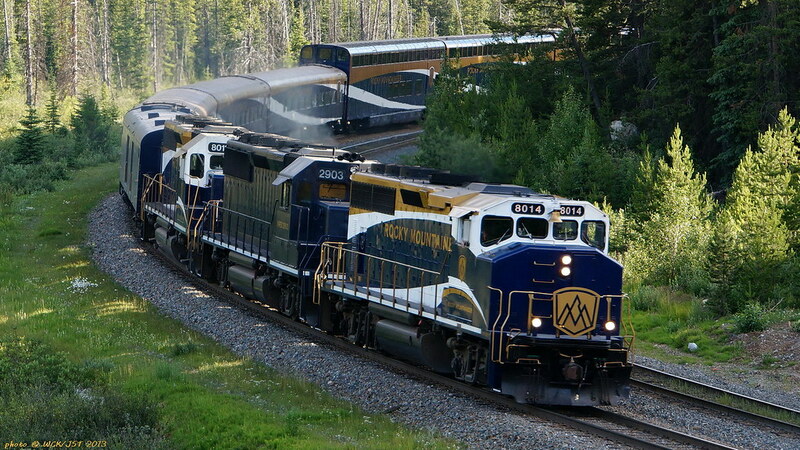 On another note, I saw the Rocky Mountaineer train come through town today, heading Southbound around noon. Usually quite rare to see that though, so I'm wondering if it has anything to do with the forest fire up near Lilloet right now? I didn't think it was you though, since I thought you were strictly with CN. Must be a nice change from dirty freight trains to clean passenger trains. It's a good chance it was me, the conductor and engineer are CN. 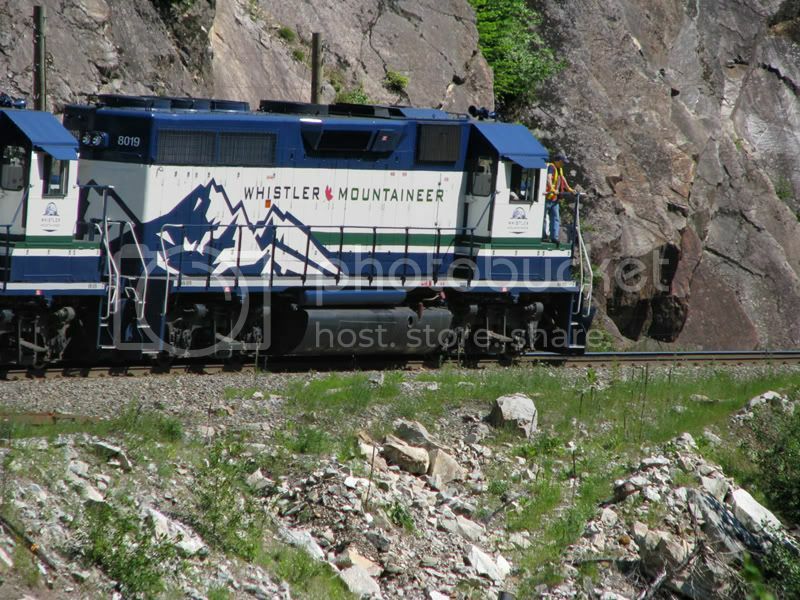 Whistler Mountaineer doesn't have their own engineers and conductors. It is a nice change, though it is different from running freight trains. The brakes work differently and you have to be very gentle. Boxcars don't complain if you bang them around, but spill someone's coffee and look out! 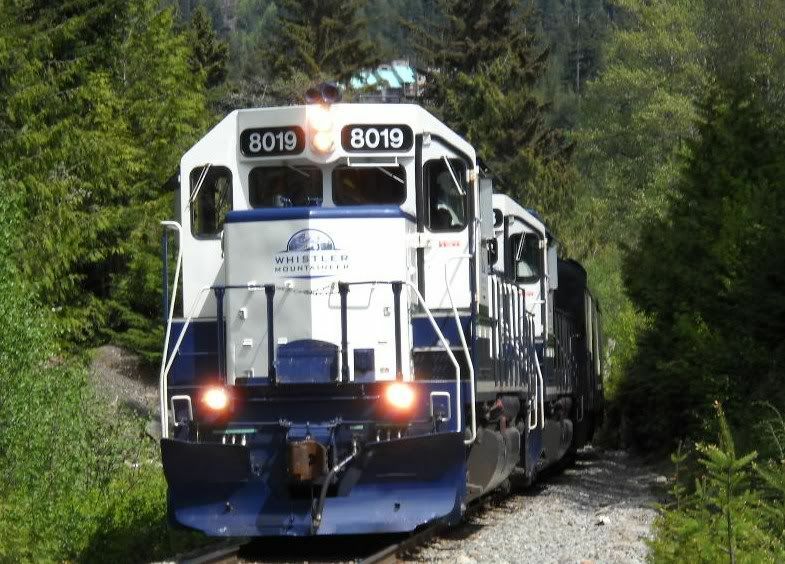 They're running that train out of Squamish/Whistler with a Squamish crew this season because it is running on such a limited schedule. With the long layover in Whistler RMR decided to base the train out of Squamish. 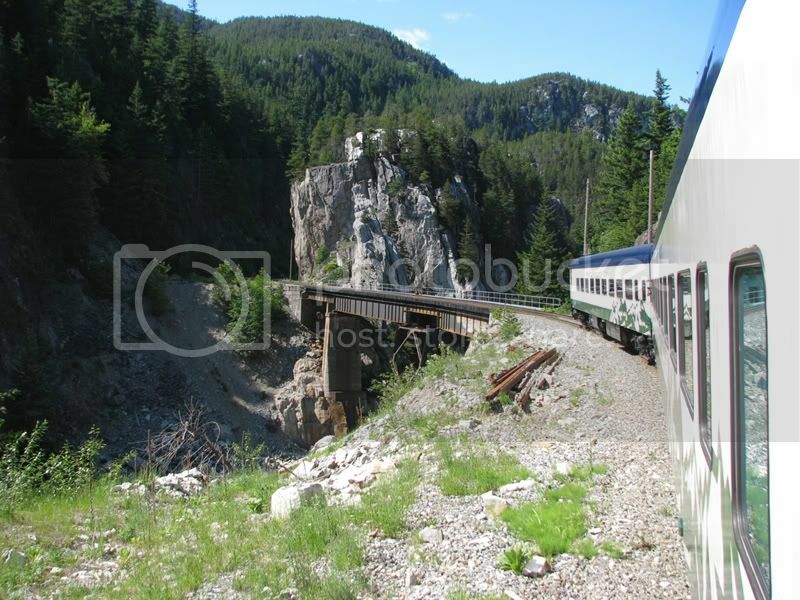 The Rocky Mountaineer labouring upgrade @ Partridge, BC, just west of Kicking Horse Pass, on Canadian Pacific's Laggan Subdivision - 23 July 2013. 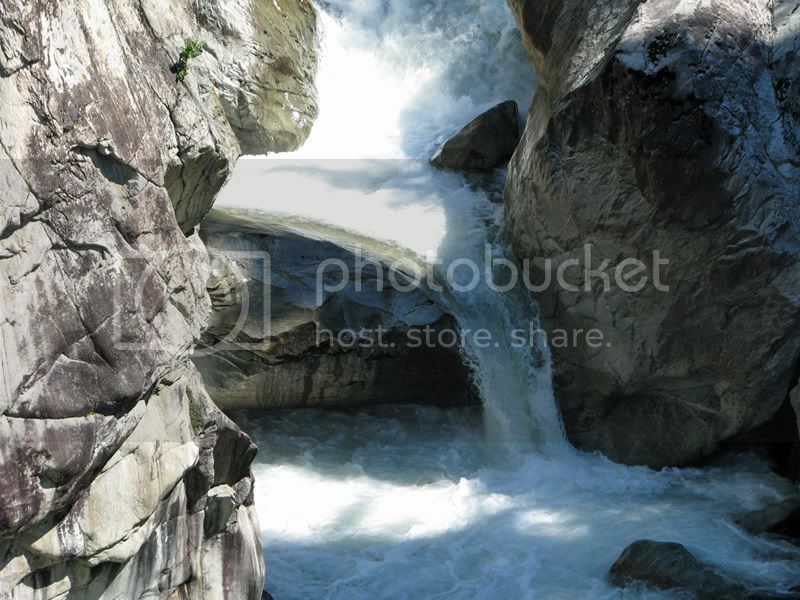 This is just east of & above the Upper Spiral Tunnel in Yoho National Park. Wonderful photo. Perfect lighting in the Rocky Mountains is a very good thing. "Partridge" siding is named for a railway worker at that location who saved some co-workers from a rock-slide, in heroic and athletic (think of a cross country sprint down a hill-side) fashion. 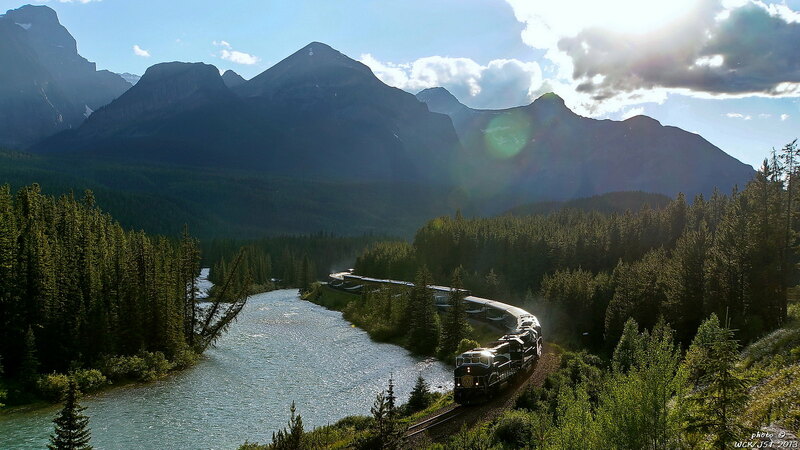 The Rocky Mountaineer east bound @ Morant's Curve, Canadian Pacific's Laggan Subdivision, near Lake Louise, Alberta - 23 July 2013. That is the 'Bow Range' in the background; the mountains that run along the Continental Divide separating BC from Alberta, and the Lake Louise/ Moraine Lake area in Banff National Park from the Lake O'hara area in Yoho National Park. This was a 'sun in your eyes' sort of shot, hence the lens flare. 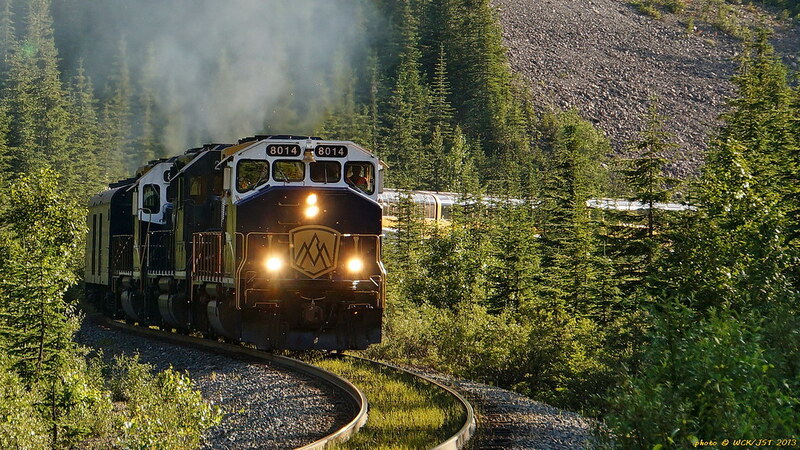 I followed this train up the 'Big Hill' from Field, BC, over Kicking Horse Pass & into Alberta & the Lake Louise area. 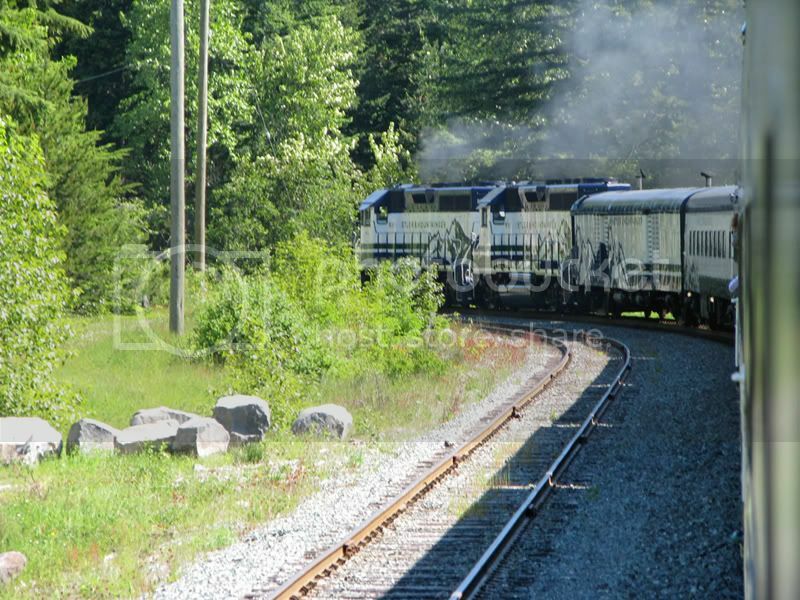 This train was equipped with three locomotives & 20+ passenger cars, an impressive site for a passenger train! Got to save some money & do a trip on this one of these days. It looks like the usual assortment of trees along the river are still intact, after the June high-river event. Yes, but it looks like a few trees are about to fall into the river. They must have had their roots undermined or washed away during the flood. The tree on the far bank standing at an angle into the water has been there for at least the last 10 years (based on my visits there). 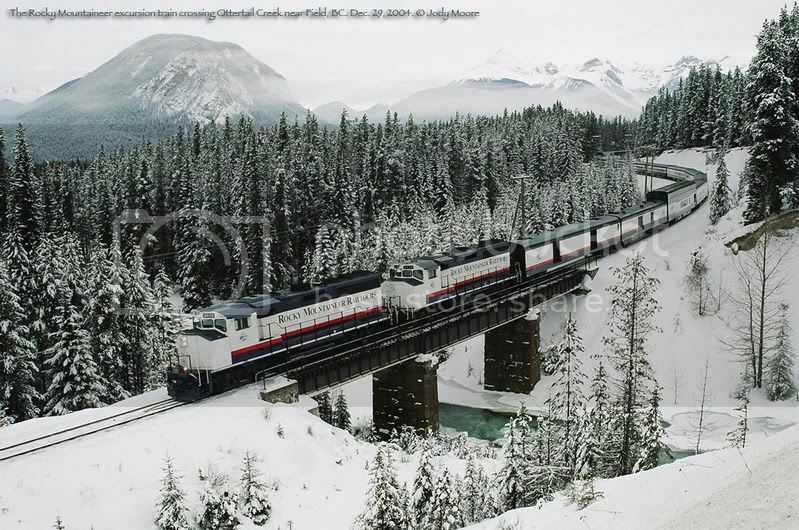 And here is the same scene from the fall of 1982... Not a lot has changed other than the fact that The Canadian now runs over the CN route via Jasper & Edmonton. The telegraph poles are gone now, too. Wow, so those trees have been leaning over like that for thirty years! Yes, probably a lot longer than that. They have been taking photos at this location for about a hundred years now. Here's one that some might enjoy. 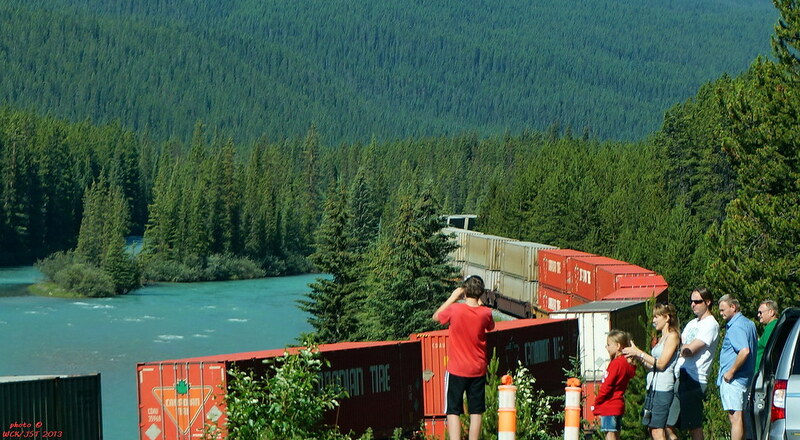 Banff park tourists lined up to watch a west bound double-stacked box train pass by. I shot this from the car as I was unable to catch the head end of this train at this point. 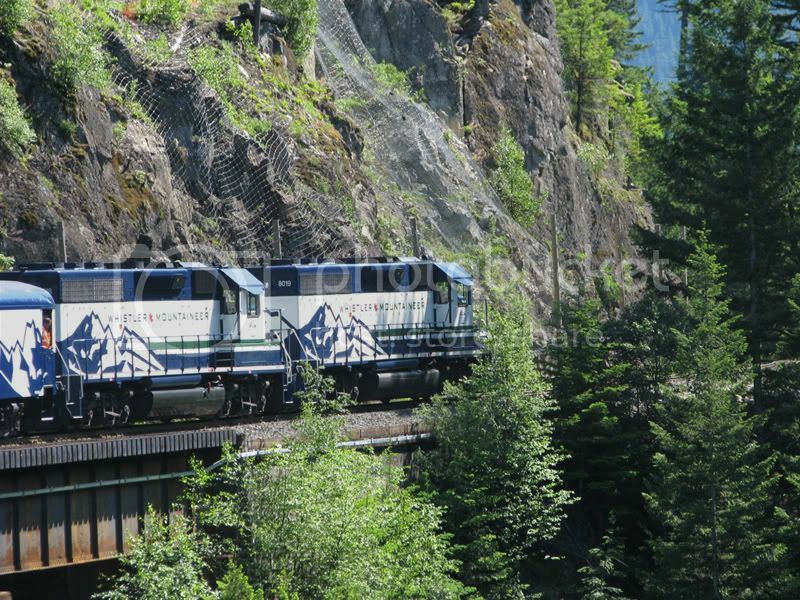 Rocky Mountaineer train at Cisco Bridges. 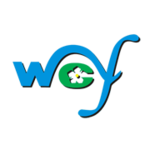 - I'm so happy to report that this is what I saw today, and this is what I'm going to show you in this post. 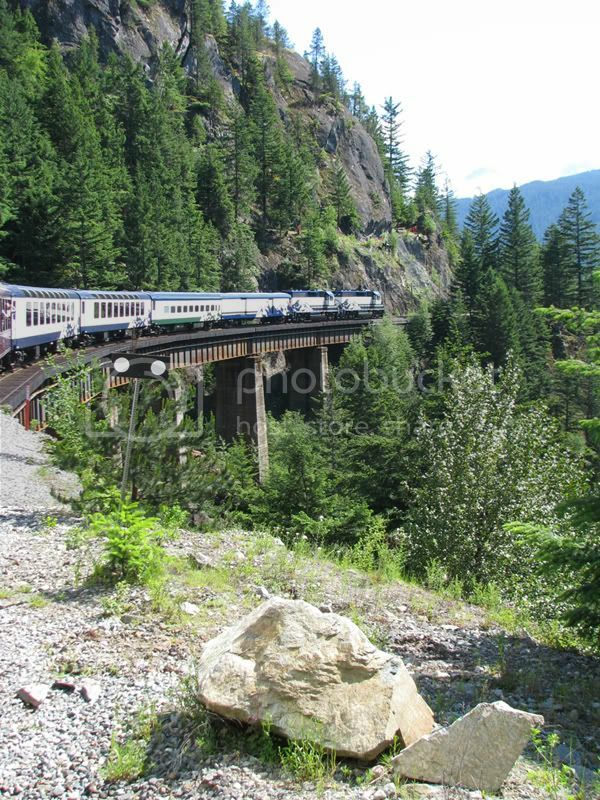 I arrived at Cisco Bridges at 9:00am, and the Rocky Mountaineer passed-by at Noon. No problem with me waiting there for 3 hours, because it was a marvelous sight to behold for a few hours, especially with the changing lighting of the morning sun and the always awesome view of those 2 bridges. I did see various freight trains between 9:00am and Noon, including 2-at-same-time crossing both bridges. (I'll post those photos/videos later). Here's my photo sequence of the Rocky Mountaineer, as she makes her way from Kamloops to Vancouver (the train that left Calgary & Banff on the previous day). You can see the length of the train here, because you can see start and end, on the curve. (wait until the video, before you try to count cars). The 2 locomotives, and 4 double-high Gold-Leaf coaches. 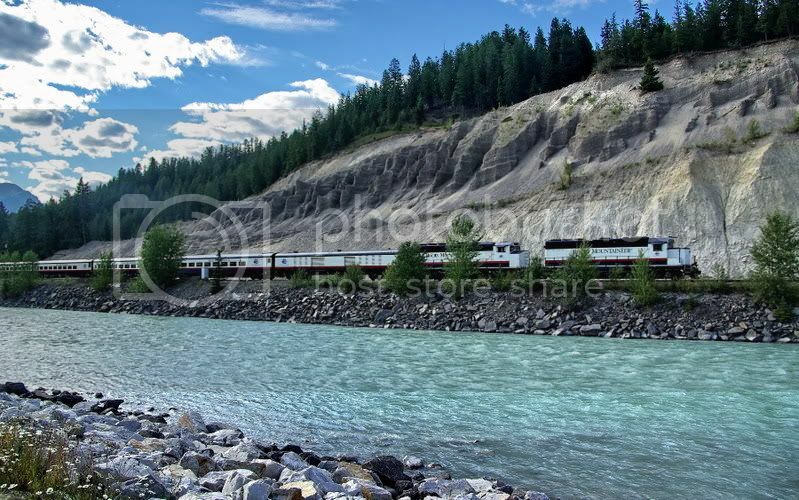 As the Rocky Mountaineer is crossing the CN bridge, a CN freight is approaching the CP bridge. The tail end of the 'Mountaineer on one bridge, and the lead locomotive of the CN freight on the other bridge. A full-scene shot, showing the CN track below my position (I'm on the road-side berm, beside Hwy-1). Final shot: 'Mountaineer locomotive appearing below me on the CN track. The CN freight train is still on the CP bridge. Video of this to be posted, in the weeks ahead. - noon on September 12, 2013. The train is westbound, on the CN track/bridge. This is day-2 of a trip from Calgary/Banff to Vancouver. 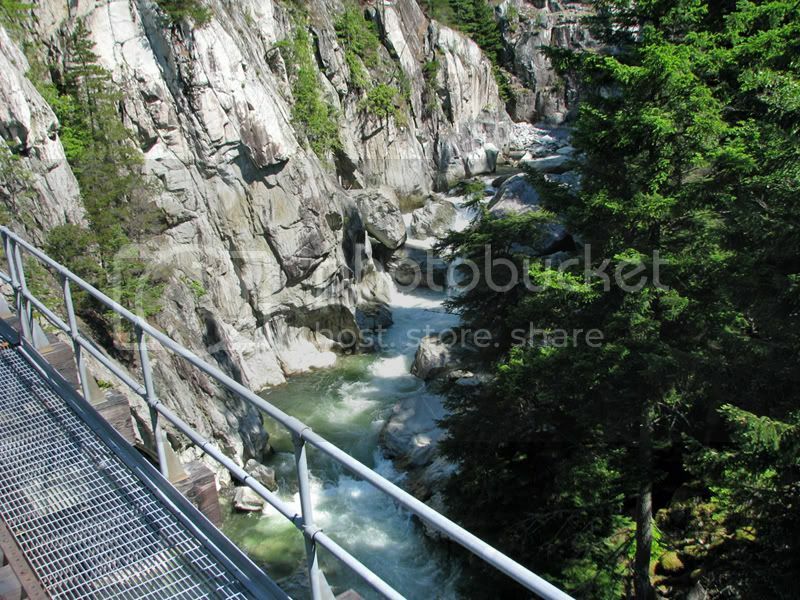 The location is south of Lytton on Hwy-1, along the Fraser River. - 1 Silver Leaf (2nd class) coach, showing small windows on the top-corners of the coach. - 1 Red Leaf (3rd class) coach, showing only standard side box-windows. - 4 Gold Leaf (1st class) coaches, which are overheight with dome-window viewing. A new thread for photos, videos, news, discussion, etc for this passenger train. 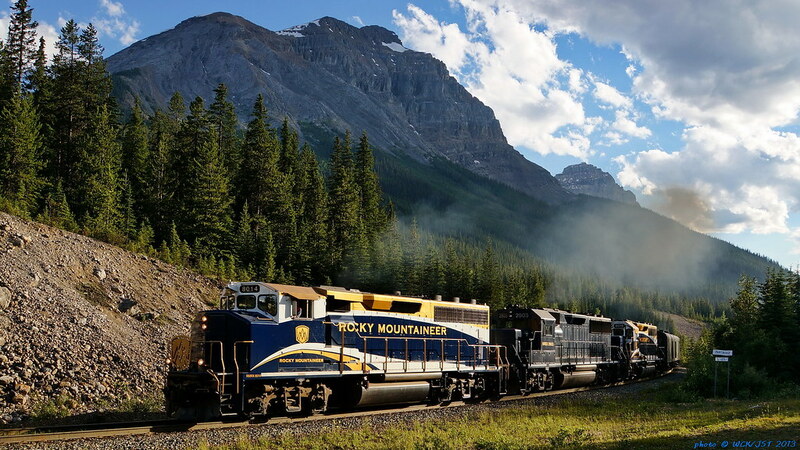 The Company is "Rocky Mountain Rail Tours" and their brand is "Rocky Mountaineer"